The NTI VOPEX� VOPEX-C5SV-16 S-Video Splitter/Extender simultaneously displays high-resolution video from one computer source to 16 remote locations via Cat5 UTP cable. The VOPEX-C5SV-16 is a real-time system which supports remote s-video devices up to 600 feet from the computer as well as local display. 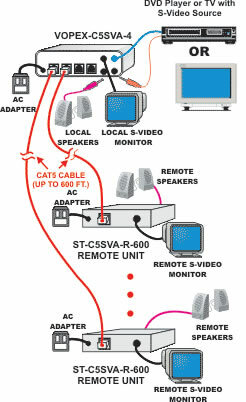 The VOPEX S-Video Splitter/Extender system has two components: the VOPEX-C5SV-16 S-Video broadcast unit, which connects to the host computer and also supplies video to a local monitor, and an XTENDEX ST-C5SV-R-600 remote unit (sold separately) for each remote monitor. The units are interconnected by CAT5 cable. Broadcast real-time s-video or audio/s-video to multiple display locations. Accompanying audio can be broadcast to self-powered stereo speakers at the remote unit as well as each remote location. Supports maximum s-video resolution - 800x600 at distances up to 600 feet. Inexpensive CAT5 cable replaces bulky video cables. A pure hardware solution - no software conflicts. Maximum input levels for s-video: 1.45 p-p.
3-foot audio cable included with unit with audio option. Operating Voltage 110 or 220 VAC at 50 or 60 Hz via AC adapter.